Ca. 15 minutes from Liverpool-Napoli. Two of Liverpool's up-and-coming youngsters, Jonjo Shelvey and Nathan Eccleston, aim to draw inspiration from captain Steven Gerrard. The England midfielder's hat-trick in the 3-1 victory over Napoli last night capped an impressive 45-minute performance after coming off the bench at half-time. Manager Roy Hodgson has called for other players to start easing the burden on Gerrard and striker Fernando Torres, and although the two teenagers are not expected to contribute significantly at the moment they cannot fail to be impressed. "It was great to be a part of that and Stevie is just phenomenal," said the 18-year-old Shelvey, whose run set up the equalising goal. "Working alongside him every day in training he is just special and the hat-trick was different class. "I thought the whole team showed a never-say-die attitude and it was a really enjoyable night." On his contribution to the vitally-important first goal, the England Under-19 captain, who joined from Charlton in the summer, added: "I ran at the defenders but I lost the ball and it was all about Steven and he got the ball through sheer determination." Eccleston came on for the last 25 minutes and was able to witness at close quarters the brilliance of Gerrard. 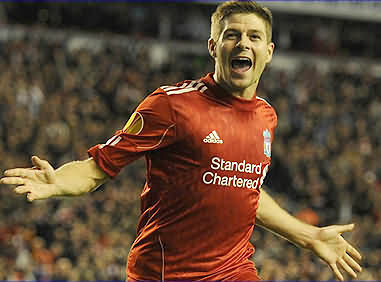 "Stevie speaks for himself and he has done that a number of times for Liverpool and England," said the 19-year-old. "It is just a real pleasure to play alongside him. The goal he got for his hat-trick was frightening ability and he made it look easy." Jamie Carragher believes captain Steven Gerrard is the best player in Liverpool's history and the most influential of the Premier League era. Gerrard came off the bench with his team trailing 1-0 to Napoli in the Europa League at half-time last night and produced a 45-minute performance which was head and shoulders above anything else on display. The 30-year-old turned the game around, scoring a hat-trick in the final 15 minutes to put Liverpool on the verge of qualification for the knockout stages. "Stevie is just an unbelievable talent, we all know that," said Carragher. "We have seen him do things like he did last night time and again during his career. "But he keeps on producing when it matters and, to me, that makes him the best player the club has ever had and the most influential player ever in the Premier League. "You could see the crowd responded to him when he came on in the second half and he lifted everybody's performance." After the game manager Roy Hodgson said he and the club owed a debt of gratitude to the England midfielder, whose one-man show helped keep alive Liverpool's mini-revival of three wins and a draw in their last four matches. "He was outstanding and we were able to get out of a tight spot," Carragher told the Liverpool Echo. "Thankfully we were able to get the win and now we have got to make sure we can keep this run going for as long as possible." Linda Pizzuti, the wife of NESV's principal owner John W Henry, has enthused on Twitter about her very first visit to Anfield to see a match after watching Steven Gerrard spark a stunning second-half comeback against Napoli at Anfield last night. Linda has been staying in Liverpool all week and after announcing on Tuesday via her Twitter account that she's "Enjoying time in Liverpool. Great Italian restaurant last night, touring Anfield today, & exploring this cool city when I can," she followed up by asking the LFC fans following her on Twitter to help her prepare for Thursday night's Europa clash by providing her with some song recommendations on Wednesday night by tweeting: "Studying up in the Anfield songbook to prepare for my first LFC match tomorrow night-can't wait! Aside from YNWA, what songs should I learn?" Throughout the game Linda and her husband looked enthralled by the action on the pitch and the atmosphere off it and judging by her Tweets after the game, the Kop certainly made its mark on the lady from Boston. "Wow! Anfield really is a special place! "she tweeted after the final whistle. "Fantastic match (certainly heard the Gerrard song!) with first class and very fun supporters. The "You're not singing anymore" chant at the muted Napoli fans once we pulled ahead was a highlight...and finally experiencing the famous Kop. Hearing, seeing, and feeling the massive force, spirit, and fun of it is incredible. Thank you for all of the song recommendations, sounds like "The Fields of Anfield Road" is my next lesson." It may have been a first time for John W Henry, but it was something Liverpool supporters have witnessed again and again. On his debut at Anfield, the club's new American owner saw Steven Gerrard ride to the rescue and transform an imminent Europa League defeat into glorious victory while sparing Roy Hodgson another inquest. With a lacklustre Liverpool trailing to Napoli at the interval, the call came. And how Gerrard responded, stepping off the bench to score a remarkable hat-trick inside the final 15 minutes and move the Anfield outfit to the brink of qualification. Even by his own lofty standards, this was a special achievement, the fourth and undoubtedly finest treble of a glittering career. And while Gerrard kissed the matchball at the final whistle, Hodgson would have been forgiven for a similarly appreciative gesture towards his captain. Certainly, until Gerrard's intervention, the only real signs of progress at Anfield had been in the directors' box rather than on the pitch, where Henry was joined by new director of football strategy Damien Comolli. Henry was taking in his first match at Anfield since heading New England Sports Ventures' £300million takeover of the club last month, and if first impressions count for anything then Hodgson can expect some taxing questions during the pair's next meeting. Wednesday's arrival of Comolli, a former director of football at Tottenham Hotspur, was taken in some quarters as undermining Hodgson's authority, despite the manager warmly welcoming a change of structure to one which he is accustomed. A poor result last night would have been as badly timed as Salvatore Aronica's dreadful second-half tackle on David Ngog from which the Frenchman was fortunate to limp away from. Instead, Liverpool have now registered three successive wins for the first time since September 2009 and head into Sunday's showdown with Chelsea with renewed hope. But it so nearly wasn't the case. “Anfield Road, it's nothing scary” read the banner in the away end and until the 75th minute it indeed seemed there was nothing to fear for Napoli, Ezequiel Lavezzi having fired the visitors into a deserved 28th-minute lead. Yet from the moment Gerrard's sheer desire saw him bundle the ball over the line ahead of Napoli goalkeeper Morgan De Sanctis for Liverpool's equaliser, the tide turned inexorably towards the home side. Now only a point against Steaua Bucharest in December will be enough to book their place in the knockout stages with a game to spare. With only one European qualification in the previous 15 years, Napoli's supporters have been starved of grand occasions and they were out in force at Anfield last night, filling the away end well before kick-off along with sections of the home stands to ensure a crackling atmosphere inside the ground. Liverpool's line-up was not dissimilar to the one which earned a goalless draw in Italy a fortnight ago, but when the onus last night changed from containment to creativity, they were found wanting until Gerrard's introduction proved the catalyst for a much-improved second-half showing. Napoli's employment of three centre-backs invited Liverpool to mine the flanks, something that has been largely absent from their play this season. The onus fell on Glen Johnson and Milan Jovanovic to provide the required width. But while a Johnson foray down the right ended with a Ngog angled shot at De Sanctis, otherwise Liverpool struggled during an opening half-hour in which the visitors demonstrated their danger on the counter-attack. Edinson Cavani had already sliced a shot horribly wide from a decent position when the Uruguay international wasted an even better opening with a similarly wild finish after a clever ball over the top from Lavezzi. Lavezzi, Napoli's main threat, then saw an ambitious effort drift wide from 20 yards before finally aligning his sights to give the visitors a deserved lead on 28 minutes. It was a poor goal for Liverpool to concede, however. Christian Poulsen, man of the match in Naples, misjudged a clearance and instead headed the ball backwards into the direction of Cavani, who instantly nodded forward to send Lavezzi clear with the striker confidently stabbing the ball underneath Pepe Reina. Poulsen immediately sought to make amends with a clever one-two that gave Ngog a glimpse of goal only for the Frenchman, under pressure, to slide his shot narrowly wide. And while Johnson, cutting inside from the right flank, then solicited a decent sprawling save from De Sanctis with a left-foot effort, there was a lack of conviction in Liverpool's response to going behind. That all changed at half-time when Hodgson, perhaps having learned his lesson from the Carling Cup defeat to Northampton Town, introduced his safety policy in the form of Gerrard. Instantly, there was vim and vigour to Liverpool's play. And they should have equalised on 51 minutes when Jonjo Shelvey, making his first Anfield start, fed Raul Meireles inside the area and the Portuguese midfielder's low cross was sidefooted at goalkeeper De Sanctis by the unmarked Ngog from six yards. Liverpool missed another gilt-edged chance on 65 minutes, Meireles turning and shooting wide from eight yards after the ball had bounced to him off Ngog, before Gerrard curled a free-kick narrowly wide after fellow substitute Nathan Eccleston was felled on the edge of the area. Then it was all down to the skipper. On 75 minutes, a mazy run from Shelvey appeared to have been curtailed by Andrea Dossena's intervention. But the former Liverpool's pass to keeper De Sanctis was just short enough to give Gerrard the chance to slide in and deflect the ball off the goalkeeper. Then, with two minutes remaining, Salvatore Aronica upended Johnson in the box and Gerrard coolly converted from the spot. And the captain completed a quite remarkable treble a minute later when a robust challenge from substitute Lucas Leiva on the hapless Dossena sent Gerrard clear and he clipped the ball brilliantly over De Sanctis. Henry leapt to his feet in delight. Comolli warmly applauded. Hodgson breathed a sigh of relief. But all three knew this was Gerrard's night. Yet again. Roy Hodgson saluted the 'outstanding' impact of Steven Gerrard after the skipper came off the bench to fire home a second-half hat-trick in the 3-1 Europa League win over Napoli on Thursday night. The Reds' hopes of strengthening their place at the summit of Group K had looked to be in danger after Ezequiel Lavezzi had given the Italians the advantage with a smart finish on 28 minutes. However, the half-time introduction of Gerrard inspired a revival, leaving Hodgson delighted with the No.8's contribution. He told his post-match press conference: "He was outstanding. I think that in the first half we hadn't played that badly. I thought we were a bit unlucky to be a goal down at half-time to an error that was punished. "But certainly in the second half his entry onto the field was a catalyst. It galvanised the crowd and the team. The way he scored the first goal epitomises the energy and spirit the team showed in the second half. "I'm delighted we got a reward for it but we do owe a big debt of gratitude to him. But I'm sure he'd be the first to join me in saying that it was a good team performance in the second half as well. "Even though he will get the plaudits, he'll agree that the whole team played well after the break and we deserved to win the game." He added: "I thought tonight was a real leader's performance. That goal that got us the equaliser wasn't a pretty goal; it was a captain's goal, one of a guy who wanted to get his team back into a match and who was determined to get the ball into the net. That is certainly appreciated by me and my staff as well as the crowd." Asked if he would have preferred to have rested Gerrard for the clash rather than introduce him in place of Milan Jovanovic at the interval, Hodgson added: ""I wanted to win the game. At half-time I felt the best chance we had of winning the game was to bring him on. I suppose had we been two or three up at half-time it would have been nice to wrap him up in cotton wool. "But Steven likes to play. He's like Jamie Carragher and Pepe Reina - they want to play. They don't seek rest periods. They understand what I'm trying to do but they don't seek it themselves. There's never any problem if I want to put them on. They are the first to put their hand up and say 'if you need me, I'm there', which is great." The victory over Napoli means Liverpool have now notched up three wins on the spin. Hodgson admits he is delighted his team have got their season back on track but has warned of over-confidence ahead of a crunch meeting with Chelsea on Sunday. "Well we've got to be careful," he said. "We play Chelsea next and that's a very tough game. If I say yes and we lose then I look like a mug and I don't want to do that. "The longer we work together the happier I am with the way the team looks on the field. But there's still work to do. Everyone knows that; the players and the people I work with. But certainly it's nice to have three straight victories - you don't get that too often at this level of football. It would be nice to make it four. "To do well in a league like we are playing in, you need a consistency in your performance and we need to do that week after week." The boss was also quizzed about the fitness of David Ngog after the striker sustained a knock to his shin late on. Hodgson added: "We are assessing it. We didn't take him off because of the knock on the shin, we took him off because of a little bit of cramp. He worked very hard during the game. But it was a bad challenge. I can only hope he'll be okay for Sunday because quite frankly we are a little bit light in the forward department. "If we lose him we don't have the same quality of option to play two up front or replace Fernando Torres if that was to be necessary in the game." Liverpool match-winner Steven Gerrard shared the credit with his team-mates despite single-handedly earning them a 3-1 win over Napoli. Gerrard's late second-half hat-trick inspired the side to a Europa League victory which highlighted the gulf in class within the squad. The Reds were deservedly behind to Ezequiel Lavezzi's goal after a dire first-half performance but the England midfielder's introduction at the interval changed the dynamic. Gerrard led from the front and scored three goals in the final 15 minutes to extend Liverpool's lead at the top of Group K.
Gerrard told five: "We went a goal down and the manager asked me to come on and see if I could help get the lads back in it. Every one of the lads in the second half was just fantastic." His equaliser came from a 50-50 challenge with goalkeeper Morgan De Sanctis after a terrible backpass and he said: "For the first goal when you're put in that position against a giant of a goalkeeper you've just got to go in and hope for the best. "There was no class involved, just determination and desire and I don't think the keeper fancied it." He added: "Everyone played their part tonight. I'm sure I'll get the headlines but it certainly wasn't just about me." Walter Mazzarri felt the referee was “influenced by the atmosphere” at Anfield, but also confessed Napoli helped Steven Gerrard to a hat-trick. The Partenopei were leading 1-0 through Ezequiel Lavezzi and largely dominated the first half, but ran out of steam and succumbed to a Gerrard hat-trick in the final 15 minutes. “I did not like the way the referee dealt with the game in the second half, but we were also naive, such as in the incident for the equaliser,” the Coach told Mediaset Premium after this 3-1 loss. Mazzarri did not mention Salvatore Aronica’s horrific tackle on David Ngog, although the same defender gave away a penalty. Napoli also shot themselves in the foot with some defensive howlers, as former Liverpool player Andrea Dossena’s weak backpass was intercepted by Gerrard. Liverpool captain Steven Gerrard came to his side’s aid once again as his late hat-trick inspired the side to a Europa League victory against Napoli which highlighted the gulf in class within the squad. The Reds were deservedly behind to Ezequiel Lavezzi’s goal after a dire first-half performance but the England midfielder’s introduction at the interval changed the dynamic. Gerrard, as he always has, led from the front and scored three goals in the final 15 minutes to extend Liverpool’s lead at the top of Group K.
It also made it two wins and two draws in the last four matches and ensured the side’s mini-revival did not come crashing to an end before it had chance to gather momentum. That Gerrard made such a difference highlighted the deficiencies on the playing staff at Anfield, with the side operating the vast majority of the second half with five central midfielders in a variety of other positions. The captain put the rest of his team-mates to shame. Newly-appointed director of football strategy Damien Comolli, watching alongside owner John Henry, must be wondering how he is expected to bring in talent to match that of Gerrard’s, such was the midfielder’s influence on the game. But both Henry and Comolli would have been disappointed with how quickly Liverpool were put on the back foot by the lively visitors in the first half. Equally worrying was the number of times they gave the ball away, a failing which ultimately cost them as one such occasion led to Napoli’s goal. Lavezzi looked dangerous from the start and his shot forced a corner off Paul Konchesky, with his next intervention releasing Edinson Cavani through the inside-left channel only for the Uruguayan to blaze over. The provider was slightly closer himself when he seized on a misplaced pass by Jonjo Shelvey to run at the Liverpool defence and fire a shot just wide of Jose Reina’s left-hand post. Pressure was starting to build and Glen Johnson, returning from a thigh injury after a four-match absence, was the first player to be booked for hacking at the back of Cavani’s legs before the Reds cracked in the 28th minute. Christian Poulsen’s aimless back-header in the centre circle was picked up by Cavani on the left and he slipped a pass through to Lavezzi who calmly steered the ball under Reina, sparking wild celebrations for the visiting fans – many of whom had managed to acquire tickets in a corner of the main stand. The response was for David Ngog to stab wide from Poulsen’s pass and Johnson to force a regulation save out of Morgan de Sanctis. But manager Roy Hodgson had already seen enough and sent Gerrard out to warm-up 10 minutes before the interval, with the captain reappearing for the second half at the expense of Milan Jovanovic. It took just 11 seconds for Gerrard to get into the game, winning a tackle with typical aggression before moments later inducing a foul from Andrea Dossena which earned the former Liverpool defender a booking. The England midfielder’s presence had certainly had the desired effect, even if it did mean the side now had even less width with five central midfielders on the field. Ngog and Shelvey wasted chances before Meireles missed the target from eight yards after latching on to Ngog’s loose pass. Gerrard curled a free-kick just wide from the edge of the penalty area but it was his sheer determination which brought the equaliser in the 75th minute. Shelvey’s run appeared to be petering out when Dossena did his former club - where he endured a miserable time – a huge favour by diverting the ball towards De Sanctis. Gerrard sensed an opportunity and charged in with his lunge enough to divert the ball past the goalkeeper. Salvatore Aronica’s 88th-minute trip on Johnson presented the captain with a penalty to double his tally and he duly obliged. In the directors’ box Henry punched the air but he had barely sat down before Gerrard completed his hat-trick and sealed the victory, cleverly dinking the ball over De Sanctis from substitute Lucas Leiva’s through-ball.